Today, I woke up at 4:00am, packed up everything, and began ascending the ice fall toward Camp II. The wind that had been blowing all night continued to blow, making it difficult to see the track in the pre-dawn hours. Spindrift blew down the glacier, burning and stinging my eyes and face as I continued climbing. I finally gained the proper route and a few long hours later, I was in Camp II. I arrived to find my tent nearly buried in spindrift and quickly worked on digging it out. I unpacked my things as everyone else in Camp II woke up. The wind was unexpected as all of our forecasts had predicted winds not in excess of 8km/hr. Later in the morning, Ferran, Yannick, and Simone began working on fixing the route to Camp III. We had decided to make the route on the face instead of in the Japanese Couloir, as this might help us to avoid the avalanche risk that all the new snow presented in the couloir. Since I had arrived in the morning, I spent the afternoon resting so that I might be useful tomorrow in fixing the route to Camp III tomorrow. 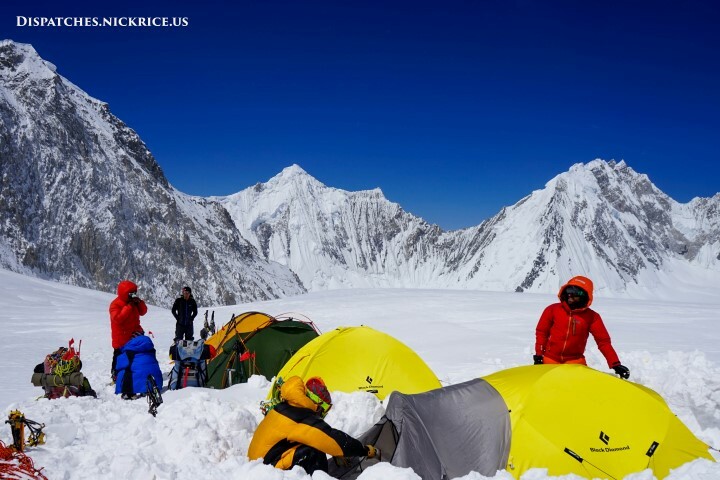 After around three hours of work on the face, Ferran, Yannick, and Simone returned to Camp. We all hid inside our tents as the wind continued to blow spindrift anywhere it could. In the evening, I spoke with Ferran who wanted to organize the plan for tomorrow. The weather was unfortunately too unpredictable for us to set a departure time so we decided in the end to wake up and see how conditions were.